Hi there! Today I’m sharing a new historical M/M Romance from JL Merrow. TO LOVE A TRAITOR is a quiet intrigue set in the immediate aftermath of what was once called “The Great War,” but we now call WWI. I really enjoyed this slow burn, between a man who mourns his brother, and the person who may have been responsible for his brother’s death. I read PLAYED! by this author, and enjoyed her work enough to seek out another book. Roger George Cottingham is a scourge to his noble family. The younger son, a bookish sort, continually passed over for affection by his parents in favor of his gregarious elder brother, Hugh, Roger knows he’s second best. When it was time to enlist in the war against the Hessians, he balked. No, he didn’t just balk, this Cambridge-educated man who speaks several languages refused to join up–knowing he was unable to kill a man. He was jailed for a miserable year as a Conscientious Objector before he was sprung and worked as a cryptographer for the Navy. Hugh was killed in a mission that seems quite dodgy on its surface. Roger’s been tasked by Hugh’s bereaved fiance (and Roger’s close childhood friend) to find out if there’s truth to the rumor that Hugh’s espionage mission was leaked to the enemy beforehand. Inquiries have led Roger to a boardinghouse, home to Matthew Connaught, an amputee veteran of the war–and the man who Hugh replaced in the covert mission. Roger takes a room at the house under the pseudonym, George Johnson, in order to befriend Matthew, and glean information regarding Hugh’s death–information which might implicate Matthew as a spy. Trouble is, Matthew is a fantastic man. He’s upbeat, and lovely, and he and George immediately hit it off. Not only that, George is attracted to Matthew–and it seems that Matthew may return his interest. For George this is a revelation that is fraught with pain. Could he possibly be falling for the man who had a part in Hugh’s death? All of his instincts say no, that Matthew is too kind and honest a man to have been a spy, but the deeper he gets involved, the more he recognizes that Matthew has some deep secrets–and he knows more about Hugh’s death than George could have predicted. I absolutely enjoyed this book. Do not expect a lot of steam–though there is some, for sure. George has a day of reckoning in his future, and his inquiries result in peace for more than one family–though it causes a significant amount of distress for Matthew, and himself. For his part, Matthew finds himself in more than one uncomfortable position, and his confessions are a balm to George, as well as Hugh’s fiance. I ached for George throughout. He’s been abandoned and cast off his whole life, and Matthew provides the compassionate friend and partner that George has been too afraid to admit needing. This is a true hurt/comfort story, with an HEA for men who’ve suffered much, and carry on in the face of grief and loss. Plus, the historical details were a delight. I truly felt as if transported to that era, and was glad for it. Interested? 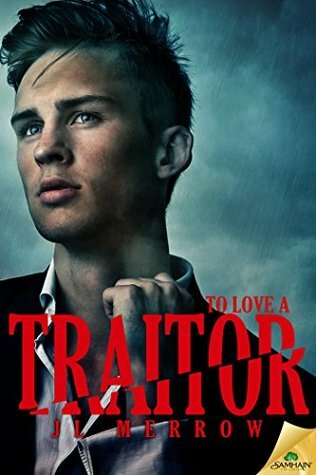 You can find TO LOVE A TRAITOR on Goodreads, Samhain Publishing, Amazon, Barnes & Noble, and AllRomance. I received a review copy of this book via NetGalley. Find JL Merrow online on her website, Twitter, and on Facebook. Sounds good. The historical context sounds interesting, too. WWI is sort of in vogue these days. It definitely scratched my “historical” itch. The language was beautiful.